Boba Fett enters the conference room of Darth Vader. Vader stands for a while, then gets right to the point, as Fett expected. No greatings were neccesary. "I have another assignment for you, Fett. It has recently been called to the emperors attention that a planet called earth in a previously unvisited galaxy called the milky way is the home of a weapon that would be very valueble to the empire. It is an intelligent alien life form that forms a symbiotic relationship with a sentient host and is capable of great destruction. It has bonded with a human male serial killer named Cletus Kassady, and together they go by name of Carnage. I need you to go to earth, kill Carnage, and bring me back the alien symbiote. It lives in the region of earth called USA, New York. YOu must be very careful, he is tremendously powerful. I will give you two million credits. What do you say?" Fett thought this over. He had been to new york, earth before, and it was a large ammount of money, a sum of which would the feed orphanages and charities he donated his credits to for months. Plus, he would have the opportunity to avenge the deaths of innocents by ridding the earth of a serial killer. "I'll do it," he said. "Good" replied Vader, and he handed him a holofile on Carnage. Boba Fett boarded Slave 1. set his coordinates for earth, and blasted into hyperspace. During Hyperspace, he read the file on Carnage. He was intrigued to discover that Carnage was also an enemy of Spider-man, whom he'd fought on his last battle to earth. He hoped Spider-man wouldn't interfere, that would complicate matters. Soon he arrived on Earth. After He left Slave 1, He fired up his jets and flew around New York, searching for his bounty. He soon spotted him amidst mush chaos, laughing crazily as he went on a killing spree. "This guy is truly crazy" thought Boba to himself, and he flew down to dispatch the monster. Ooh, its Buzzlightyear" laughed Carnage. "i'm so scared!" Boba replied: "I don't know what that means, nor do I care. But your going down, monster." So, who do you think would win? Hard choice, but I think carnage would take over Boba, but when it comes down to it, Boba would find SOME WAY to get rid of him. Great job on the writting Spidey! I really look forward to things like this out of you. keep up the good work! Boba has a flame-thrower, case closed. And a sonic beam weapon. Sonic beams don't really hurt Carnage, they only hurt Venom. Fire, however, is Carnage's main weakness. If Fett used his flamethrower, he'd win. BUt if for some reason he didn't have it, or if Carnage was able to destroy it before he could use it, then Boba would unfortunately be a dead man. So that's the cast of characters so far, with possibly more to be added. 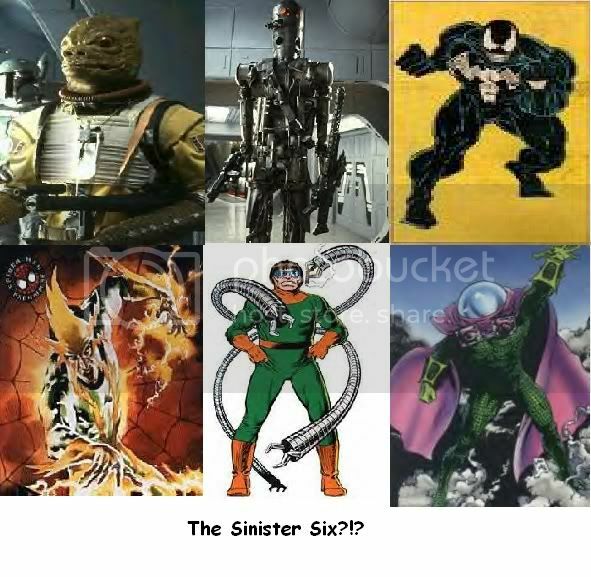 There is even going to be a new incarnation of the sinister six, consisting of Ock, Electro, Mysterio, Venom III, IG-88, and Bossk. YOur thoughts and sggestions? Yay im in it sounds good . I'd love to read a comic book about that. Hey, what if in this story, Spidey ( and the new Sinister 6) gets a taste of the SWU? That'd be awesome! And I think the emperor should be in there. And Sandman. and the FF. just saying. But seriously, awesome! Ah, possibilties, possibilities.......and the only thing standing between the two worlds is a warp hole. What is wrong with Deadpool? he is easily the greatest that you listed. By the way, none of those characters were actually bounty hunters. Bounty hunters, mercenaries, same thing. And Deadpool would just break the 4th wall so much...okay, nothing wrong with Deadpool. I know I'm probably annoying you with all these ideas. Nah, you're not annoying me. You're expanding my horizons to make this story a better one. After all, it was your idea to make the emporor put a bounty on the Carnage symbiote. Maybe I will add some marvel bounty hunters/mercenaries. Like Elektra, or maybe Hobgoblin. Perhaps Deadpool. Yeah, but I'm thinking either hobgoblin or bullseye. Hey, if any moderators are reading this, would you please be so kind as to do two things? One of them is to change the title of this topic to Boba Fett and Spider-man:Total Carnage, and the other is to move it to the creative section. Please? There is even going to be a new incarnation of the sinister six, consisting of Ock, Electro, Mysterio, Venom III, IG-88, and Bossk. That is quite possibly the most awesome thing I have heard in a long time. Somebody has to Photoshop something for this, seriously...flipping sweet. wow, this is going to be one AWESOME fan fic!!! The deadliest ensemble of villians yet...I like it. And Ph34r, your sig actually made me laugh out loud, which is a rare feat that I congratulate you on. And before some continuity psycho gets onto me, I know the Venom I put in that picture is Venom I and not Venom III. However, I couldn't find a picture of Venom III. I think that word "sinister" might be a bit big for Bossk. I also thought your signiture was very funny. The only thing that would make it funnier (in my opinion) is if it was Darth Vader instead of Jabba. Oh, Bossk is very sinister...don't judge him by that picture. He's probably more "sinister" than all of them except for Venom. I mean the word may be a bit hard for him to understand.